"My version of eggs benedict. Serve your bacon or sausage on side with vegetables. Everyone loves this." Bring olive oil, 1 tablespoon vinegar, and water to boil in a large pot. Place artichoke hearts in the mixture, and boil 30 minutes, or until tender; drain. Prepare Hollandaise Sauce according to recipe directions. Fill a large saucepan with 3 inches of water. Bring water to a gentle simmer, and add remaining vinegar. Carefully break eggs into simmering water, and allow to cook for 3 to 5 minutes. Yolks should still be soft in center. Remove eggs from water with a slotted spoon and set on a warm plate. Place artichoke hearts on a serving platter. Place a poached egg on top of each artichoke heart. Cover with hollandaise sauce. Sprinkle olives on top of sauce. Sprinkle chives around platter. 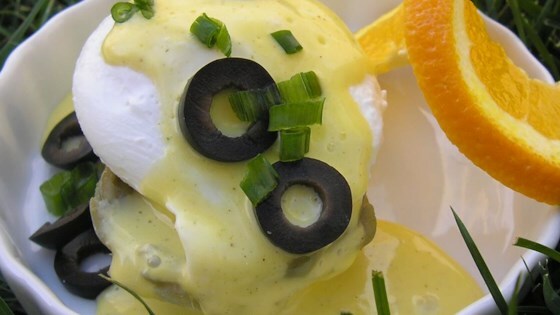 Get the recipe for Hollandaise Sauce. For expediency I used artichoke hearts from a can and a Hollandaise mix packet. I really loved the way the earthy flavors from the artichoke hearts, black olives and scallions came together! or 1 can artichoke bottoms, 1 recipe hollandaise or 1 container prepared Hollandaise from T. Joe's, 3 eggs, sliced black olives, chopped chives. Sooo easy and soooooo good.